It’s hard to believe that November is already here, which marks the beginning of holiday season! 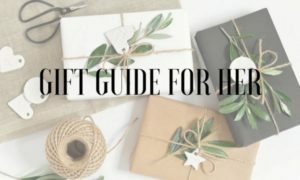 Whether you’re looking for bridesmaids gifts or want to get a jumpstart on your holiday shopping, we’ve put together some of our current favorites. Pretty gifts that feel thoughtful and so special — the perfect way to ask your best friends to be in your wedding party, or to put on your own holiday wish list!